[151 Pages Report] The Moisture Curing Adhesives Market was valued at USD 3.80 Billion in 2015 and is projected to reach USD 5.77 Billion by 2021, at a CAGR of 7.4% from 2016 to 2021. In this study, 2015 has been considered the base year and 2016 to 2021 the forecast period to project the market size of moisture cure adhesives. The global market for moisture cure adhesives is led by players such as Henkel AG & Co. KGaA (Germany), H.B. Fuller (U.S.), 3M Company (U.S.), Sika AG (Switzerland), Royal Adhesives & Sealants, LLC (U.S.), The Dow Chemical Company (U.S.), Illinois Tool Works Inc. (U.S.), Bostik SA (France), Dow Corning Corporation (U.S.) and Jowat SE (Germany), among others. This report categorizes the global moisture cure adhesives market based on chemistry, application, and region. 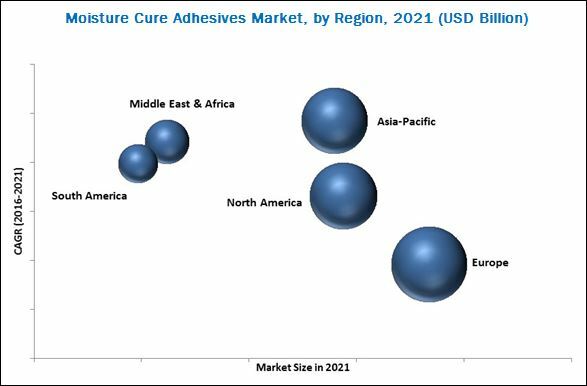 Development of alternatives such as UV cured adhesives, bio-based adhesives, and comparatively high curing time are factors restraining the growth of the moisture cure adhesives market. Mergers & acquisitions, expansions as well as new product developments were the major strategies adopted by most players in the market during 2013-2017. Companies such as Bostik SA (France), Henkel AG & Co. KGaA (Germany), H.B. Fuller (U.S.), Sika AG (Switzerland), Royal Adhesives & Sealants, LLC (U.S.) Momentive Performance Materials Inc. (U.S.), The Dow Chemical Company (U.S.), Illinois Tool Works Inc. (U.S.), and Dow Corning Corporation (U.S.) were the key players who adopted these strategies to expand customer base, increase their product offerings, and to stay ahead of their competitors. 11.7 Illinois Tool Works Inc.
11.11 Momentive Performance Materials Inc.
11.23 Daubert Chemical Company Inc.